Located on Small Jishi Hill about 35 kilometers southwest of Yongjing County, Gansu Province, these grottoes (炳灵寺石窟) were hollowed out in the precipitous cliffs above the Yellow River in Yongjia County. The first grotto was begun around 420 at the end of the Western Jin Dynasty. 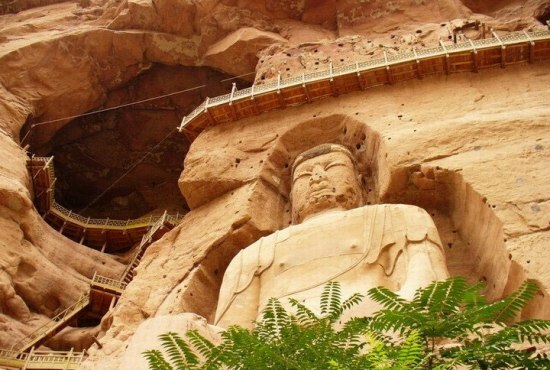 Bingling Temple, facing the Yellow River, contains 183 grottoes and shrines stretching for 2 kilometers. Most of the elegant stone carvings, clay sculptures, murals and auxiliary buildings were created during the Tang Dynasty. - How to get there: Boats leave from near the Liujiaxia Dam in Liujiaxia and takes between 3 hours and 8 hours.